Dubai has become a world-famous destination for its unbelievable feats of architecture. Who’d have thought of building an enormous fake island in the ocean, that too in the shape of an open palm leaf? Dubai would, and Dubai did. Dubai is home to the fabulously intricate Dubai Mall, the world’s biggest shopping mall. Then there’s the BurjKhalifa, the tallest building in the world. The world’s only 7-star hotel, Burj Al Arab is a sail-shaped marvel of architecture. There are several more unbelievable architectural marvels in Dubai – here are 7 of the best. It took a mere 6 years to complete what is today the world’s tallest and most famous building in Dubai– the Burj Khalifa. In 6 years, the world’s top architects built a 160-storey high, 829-meter-tall building, whose spire is visible from 95 kilometers away. The 158th floor has the highest mosque in the world, while the 76th floor contains a large swimming pool holding tons and tons of water. The observation deck on the 124th floor affords a spectacular view of Dubai’s scintillating skyline. Skidmore, Owings and Merrill LLP (SOM) of Chicago constructed the Burj Khalifa at a budget of 4 billion USD. 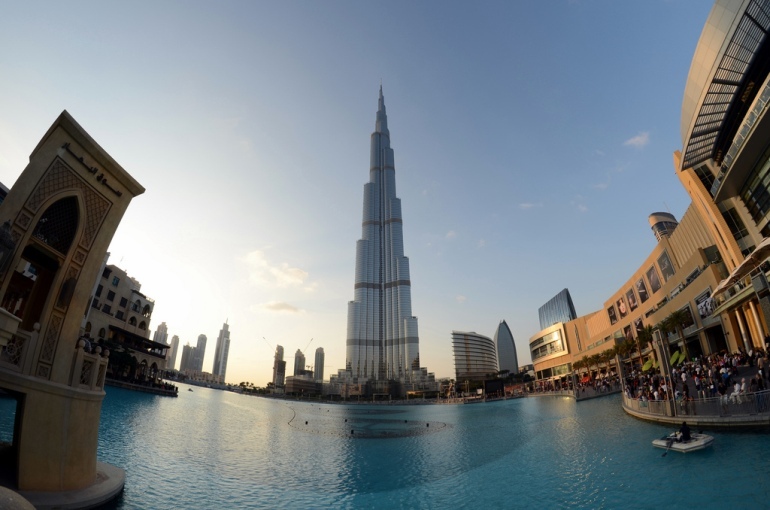 Burj Khalifa holds several records for the tallest building, tallest observation deck, tallest freestanding structure, tallest occupied floor and many more. The Burj Khalifa’s design is based on the tenets of Islamic architecture. The tower is built with 27 setbacks, which create elegant balconies while rising in a spiral design. The setback alignment also helps to minimize vibration due to wind currents and vortices. The core of the tower is constructed as a spire, in keeping again with Islamic architecture. Jumeirah Beach Hotel is shaped to resemble an ocean wave; the body of the hotel is built at a twisted angle that creates a charming wave shape, which beautifully complements the sail shape of the Burj Al Arab. During the construction of the Jumeirah Beach Hotel, a total of 33,800 square meters of beach was created using fine white sands to delight visitors. The Wild Wadi Water Park is situated next to the hotel, offering unlimited access to all of the hotel’s guests. 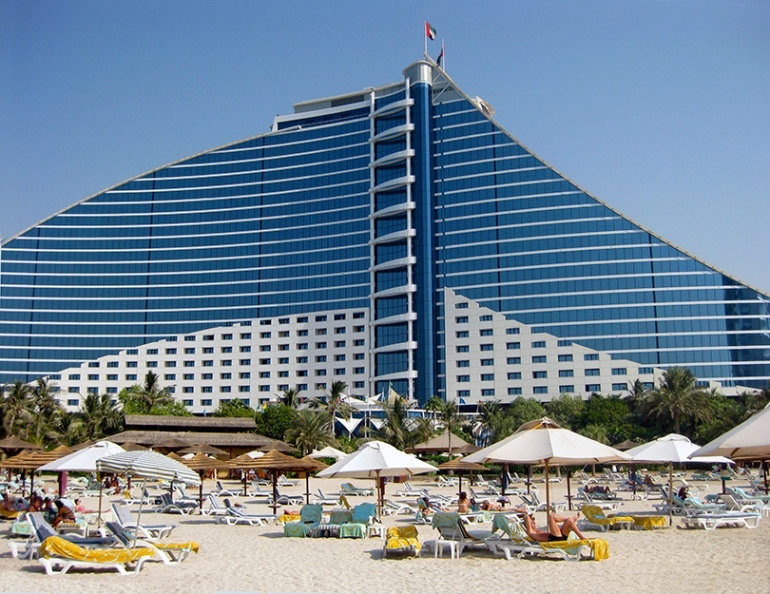 The Jumeirah Beach Hotel is considered one of the famous architectures in Dubai. The hotel rests on the beach surrounding the artificial Palm Islands. It took all of 3 years to achieve a sound foundation and a structurally sound building that would remain safe from erosion. The Atkins firm did the civil and structural engineering, architecture, MEP engineering and construction supervision. The hotel is 93 meters high, with a 275-meter wide silhouette in the shape of a large wave. The wave is constructed with long layered facades, to create the illusion of a swelling and breaking wave. The hotel’s corridors are also curved; this offers beautiful sunset views from all the 600 rooms. 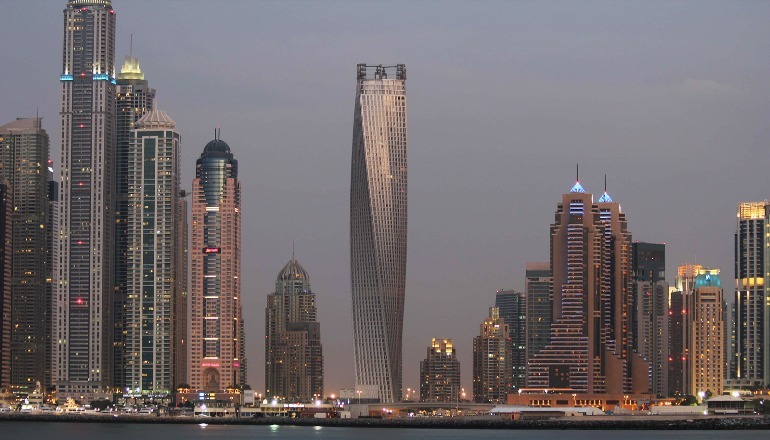 Imagine this – a building that’s twisted 90 degrees from base to roof, without any structural pillars! That’s the architectural miracle achieved by the engineers who’ve designed and built the Cayan Tower in Dubai. It is a residential building that’s 306 meters tall, containing 73 floors. The people who can afford to buy flats in the Cayan Tower enjoy the most amazing views of the surrounding waterfront. The building has no balconies, which keeps the sun out even in peak summer (55 Deg Celsius). The engineers reduced solar gain by layering titanium-colored paneling into staggered concrete columns. The apartments are built without balconies, further keeping the sun’s heat away. Dubai has three artificial islands, of which the Palm Jumeirah is the largest. The other islands are The Palm Jebel Ali and The Palm Deira. 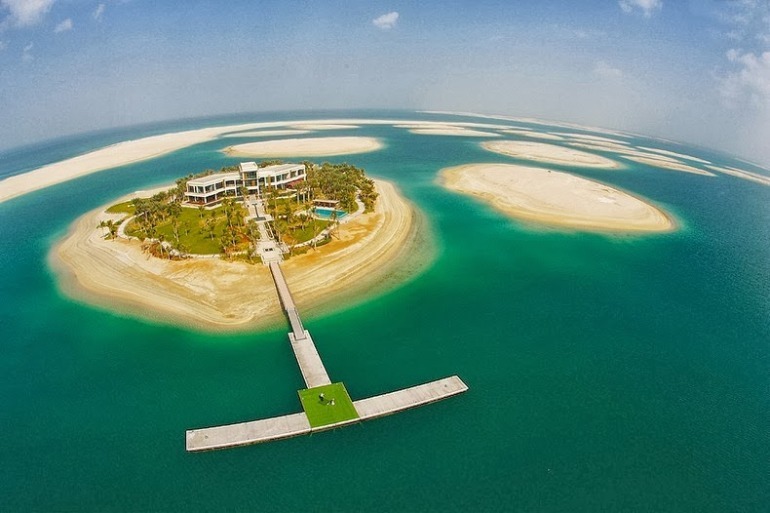 These Islands are located in the Persian Gulf off the coast of the UAE. By building these islands, the builders have added 520 kilometers of beaches to Dubai’s coastline. The exotic Palm Islands were built by the UAE-based Nakheel Properties. A global specialist marine contractor from Holland, Van Oord, was hired to dredge the sands and reclaim the land. It took about 10 to 15 years to create these three spectacular artificial islands from scratch, beginning in June 2001. One hundred million cubic meters of sand and rock were used to lay the foundation of Palm Jumeirah and Palm Jebel Ali. The third island, Palm Deira, used up 1 billion cubic meters of sand and rock, every bit of it quarried within the UAE. 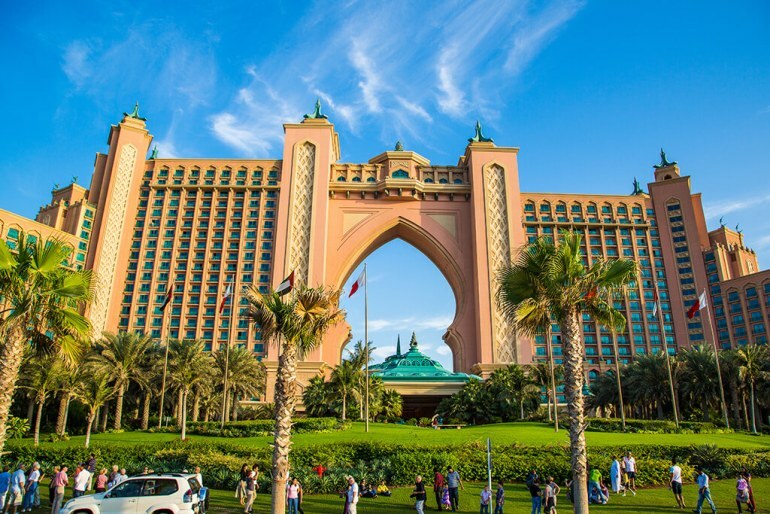 The islands boast of beach side villas and apartments, 100+ luxury hotels, water theme parks, marinas, restaurants, shopping malls, health spas and sports facilities. The entirely man-made World Map Islands are actually an archipelago made of 300 islands, designed in the shape of a world map. Tons of sand was dredged from the sea to build these islands. Each island is between 250,000–900,000 square feet in size, with a breakwater of 50 to 100 meters between them. The overall World Map Islands development covers a length of 9 kilometers and 6 kilometers in width. You can get from one island to the other only by boat or by helicopter. The mega structure costs the builders over $15 Billion US Dollars. The best way to view these islands is via helicopter; the world map is beautifully defined in outline when seen from the air. 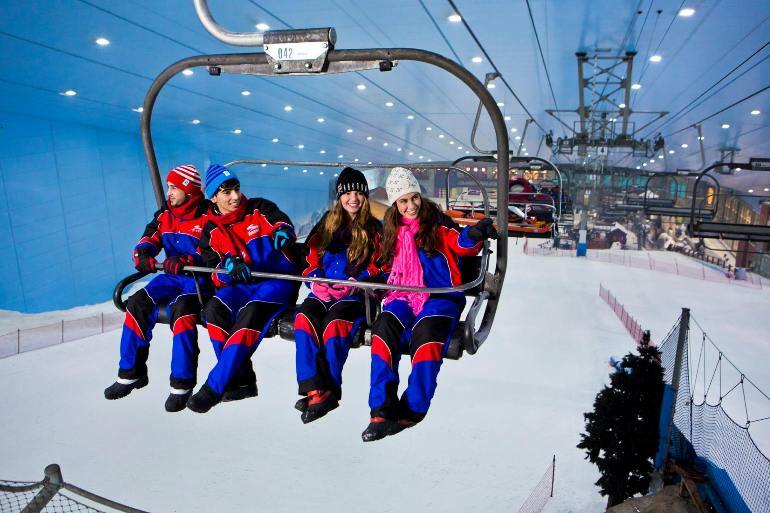 Ski Dubai, situated within the Mall of the Emirates, offers a blissfully cold 22,500-square meters of indoor ski area. There are several ski slopes of varying severity to suit everyone, from beginners to experts. The efficient insulation system maintains temperatures at -1 degrees Celsius and -6 at night. The system maintains consistent sub-zero temperatures, even under Dubai’s max temperature of 55 degrees Celsius. Snow is produced at night, when the temperature is at its lowest. Ski Dubai offers the heat-exhausted locals a fabulous chance to soak up some coolness. The Burj al-Arab, the world’s 4th tallest hotel is a marvel of engineering. Shaped exactly like the spinnaker sail of a J-class yacht, the hotel is one of Dubai’s most photographed buildings. The Burj Al Arab stands proud with its wave-shaped sister the Jumeirah Beach Hotel. The hotel’s atrium is 590 feet tall and it has a helipad to transport visitors. 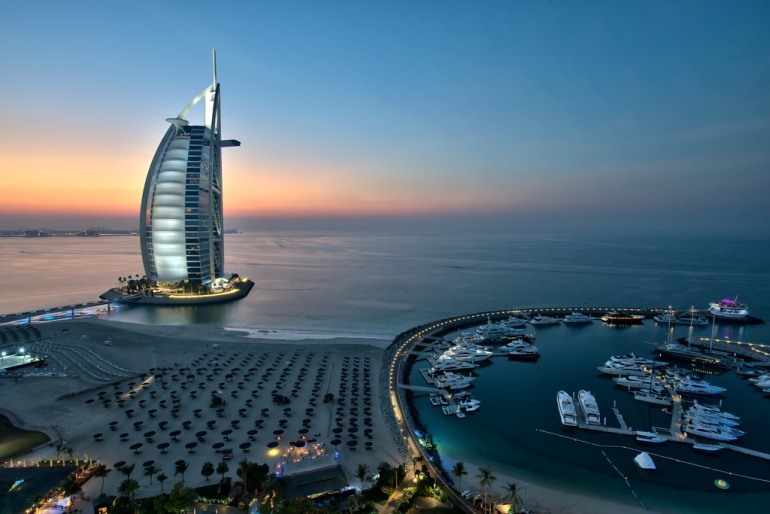 Sign up for the Burj Al Arab tours when you’re in Dubai and explore this hotel in full. In order to maintain its unique shape, 39% of the Burj Al Arab’s total height consists of unoccupied space. To ensure a foundation strong enough to fight erosion, structural engineers drove 230 numbers of 40-meter concrete piles into the sand. On top of it they built a honeycomb of concrete laid over rocks. Overall, the hotel contains more than 9,000 tons of steel and 70,000 m3 (92,000 cu yd) of concrete. The architect behind the Burj Al Arab hotel is Tom Wright of WS Atkins. Canadian engineer Rick Gregory did the designs and supervised the construction. Dubai is not done with its grand accomplishments yet. 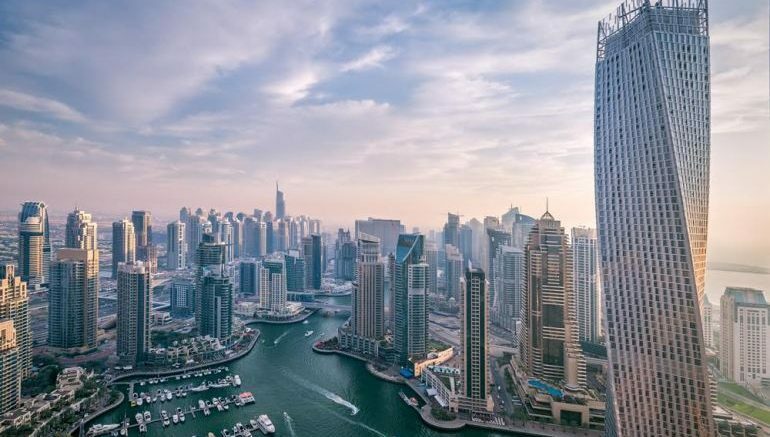 Planned projects include the Dubai Trade Centre Jebel Ali (Expo 2020), Manchester Tower in Dubai Marina, Dubai Exhibition City, Park Island in Dubai Marina and several others. Dubai continues to thrill and delight people from all walks of life with its grandiose designs and spectacularly-executed architecture. Money is never an object in this oil-rich country, which aims to be put on the map for spectacular buildings. We can look forward to more architectural marvels from Dubai in the near future. The article was submitted by Neha Singh. A postgraduate in Mass Communications, Neha loves everything about life. Traveling is extremely close to her heart and writing came to her naturally. An avid trekker & explorer, who often takes off some time from her busy life for mountaineering, she loves meeting new people & gets attached to their culture very easily. Her ambition is to explore as many places as she can in her life. She strongly believes in Gandhian principle – “simple living high thinking”. 2 Comments on "7 of the most magnificent architectural wonders of Dubai"
Dubai is the world of inventions and architecture wonders. Soon they will overtake western countries in technology sector. Thank you very much for your writing. It is very informative and give visual knowledge to the outsiders regarding where Dubai stands now. They wil never overtake Civil countries. Arabs are to stupid to produce something original. It’s all import!